Statewide, general aviation pilots and small commercial companies have been praising the use of weather cameras to help reduce accident rates. These cameras provide near real-time images of meteorological conditions critical to the flight planning of VFR pilots. Therefore, the pilots asked Alaska’s Senator Stevens to help obtain Federal funding for weather cameras to be located in the mountain passes of Alaska. The Senator helped pass legislation that provided the FAA funding for additional camera installations in Alaskan mountain passes so we do not continue to add to the graveyard of planes in several passes. The purpose of the Weather Cameras (WCAMS) is to aid in decision-making by pilots. By reviewing images from the WCAMs located in mountain passes, pilots can make decisions whether or not to attempt VFR flight before taking off—therefore decreasing the risk of a flight in poor weather. The cameras provide a visual on the pre-flight weather briefing giving the pilot site-specific information at critical locations in the passes. Currently, three cameras are located in Lake Clark Pass. On the construction schedule, the FAA is proposing an additional installation in Lake Clark Pass and installations in Merrill Pass, Rainy Pass and/or Ptarmigan Pass. Typically, two to four cameras are installed per location so that the en-route weather conditions can be evaluated. Images are captured every 10 minutes and made available on the FAA web site. The web page for each location includes a sectional map, a topographic map, and multiple camera images (e.g., north, south, east, west) named by the direction of view. The pages also include a “clear day” image to contrast to the image depicting current conditions. The FAA is currently field testing the Iridium satellite equipment, installed the fall of 2005. The test installation is reviewing the performance of the CC640 Digital Camera, Campbell Scientific data acquisition equipment, and the availability of the Iridium communications link. The test configuration has a 2.4K modem at the remote pass site and an additional modem linked to a test platform using Loggernet’s LNcmd.exe to retrieve the images stored on the CR1000. Every 10 minutes, a Loggernet task contacts the remote equipment and retrieves the latest image, weather data, and equipment data. Currently, this data is located on an FAA test server. The FAA will also be field testing VSAT communications link beginning in the Spring of 2006. The FAA is pleased with the low temperature performance of the CC640, CR1000, and the rest of the equipment. The diminished requirement for heaters, as well as the low power usage of the equipment, has reduced the need for additional batteries, solar panels, and wind generators. The system is powered by four 85 Watt solar panels connected to a 200 Amp-Hr glass mat battery via a charging regulator. The majority of the power budget is allocated to the Iridium satellite transmitter, creating the possibility that sites with a less power-consumptive form of communication could be fitted with more modest power supply equipment. To further help with power conservation, the CR1000 is programmed with an algorithm to calculate Civil Twilight. Civil Twilight is the period of time before sunrise and sunset when the center of the sun is six degrees below the horizon. Civil Twilight illumination is sufficient, under good weather conditions, for terrestrial objects to be clearly distinguished. The datalogger uses the output of this algorithm to shut off power to equipment that is not needed during nighttime intervals. 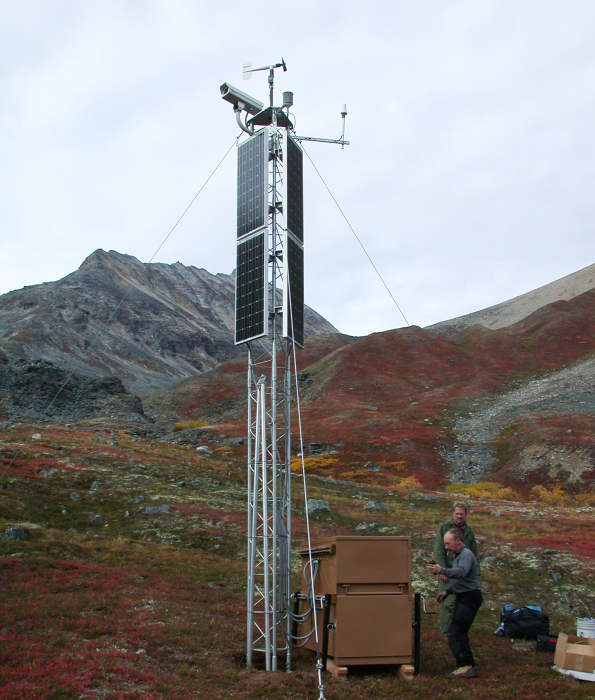 Due to the location of the equipment in tight mountain passes with limited solar visibility and extremely cold temperatures, Campbell Scientific equipment will likely become the standard for the remote, self-contained camera installations.